Coke vs Pepsi: Who Wins on Social? Given the rapidly changing consumer trends, as thirsty customers are craving less sugary and more natural refreshment solutions, the Coke vs Pepsi war is at its peak. Both rivals are under pressure to stay top of mind in terms of instant refreshment and indulgent choice. Given the rapidly changing consumer trends, as thirsty customers are craving for less sugary and more natural refreshment solutions, the Coke vs Pepsi war is at its peak. Both rivals are under pressure to stay top of mind in terms of instant refreshment and indulgent choice. 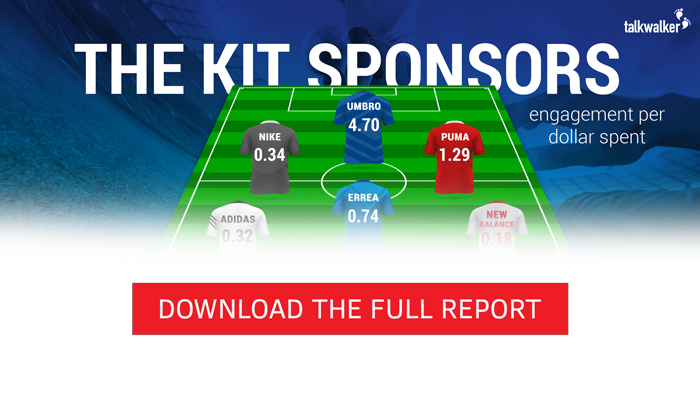 Marketers are interested in how both brands handle this challenge in terms of market share, sponsorships, brand endorsements, and social media strategy. Talkwalker did an in-depth analysis of both soda brands’ strategies in terms of world sports event sponsorships, its close link to celebrity endorsement, and the pay-off in terms of ROI per social media relevance and endorsement. Globally speaking, Coca-Cola heads the brand valuation game, ranking number 6 compared to 29 for Pepsi on Forbes World’s Most Valuable brands in 2019. Coca-Cola also enjoys a higher market capitalization on the stock exchange, with $204.87 billion value versus $159 billion for PepsiCo, by end of January 2019. Q3 2018 year-to-date company figures show that both companies somehow struggle in the strategic North America beverage market. Coca-Cola’s soda drinks volume increased by a low +1% with operating profits being down by -2%, while Pepsi’s beverage volumes are down by -2% with revenues dwindling by -17%. These figures show that the battle is fierce, and that both brands spend big bucks on marketing to increase their market share in a consolidating market. Social media is a key channel for both brands in order to convey their brand content to the young and thirsty crowd. Both brands invest heavily in teen music bands and celebrity endorsement. This dual strategy seems to pay off as the younger generation likes to follow and comment on their pop idols online. Coca-Cola welcomes 107.62 million fans on Facebook, compared to 37.86 million for Pepsi. of strong celebrity endorsement and the World Cup. 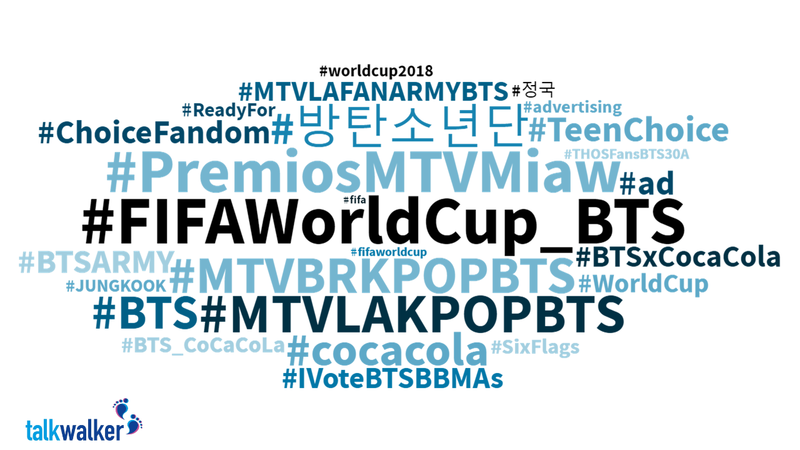 The announcement days before the World Cup of BTS, a South Korean boy band, as Coca-Cola’s brand ambassador generated the biggest social media buzz of the year for the Atlanta-based company, with over 615,000 mentions. Meanwhile, South Korean boy band YDPP’s mash-up with Pepsi early 2018 and Cardi B’s Super Bowl 2019 ad generated massive social media impact for Pepsi. On a worldwide level, Coca-Cola generated 12.2 million brand mentions and 117.2 million engagements over the last 12 months, while Pepsi generated 7.8 million brand mentions and 75.2 million engagements. This seems obvious as the World Cup and BTS speak to a larger audience than Pepsi’s brand activities. won with all year long stronger engagements. The World Cup impact is way lower in the US, but BTS’s notoriety in the States still led to 262,000 mentions during the presentation of the partnership with Coca-Cola. Pepsi erased Coca-Cola’s online presence during the 2019 Super Bowl, with a strong Cardi B advertising reveal and a PepsiHalfTimeShow that was in the news due to its powerful Maroon 5 performance, grossing 387,000 mentions for Coca-Cola’s rival. In the US, Pepsi generated 4 million mentions and 39.8 million engagements over the last 12 months, compared to Coca-Cola’s 3.7 million mentions and 59.2 million engagements. This shows that even with a lower level of single mentions, Coca-Cola generates more shares and likes with its marketing effort. Hence, the company’s strategy to invest both in an international sports event and a boy band creates more buzz in the States than the one-day-hit Super Bowl for Pepsi. It’s a tough game for Pepsi. On both global and US levels, music celebrity endorsements were the key social media drivers for both brands, with more impact than any single mass event or product launch. Both companies follow the same strategy, by hosting major sports events with massive impact on all generations of consumers and leveraging these events with K-Pop or rap musician endorsements to fuel Generation Z’s viral gluttony. 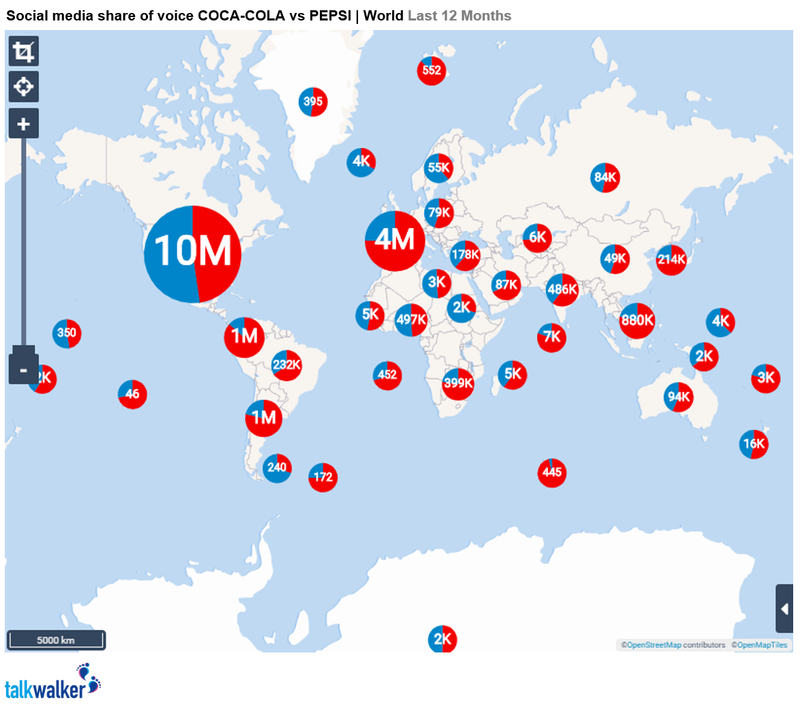 With Pepsi in blue and Coca-Cola in red, the world map of both brands’ social media presence during the last 12 months reveals that the US market constitutes the decisive online battle in terms of online buzz between both brands, in terms of volume and share of voice. According to available data, the 2018 World Cup’s first week generated 459 million posts, likes and comments on Facebook, compared to Super Bowl’s 185 million interactions, 120 million for the Winter Olympics and 25.4 for the Oscars. Sports has always been a common denominator for both soda brands to engage with their fellow customers and fans. Coca-Cola, the red defender, in a long-term relationship with the Fédération Internationale de Football Association (FIFA), has a sponsor history with the World Cup lasting since 1978. Pepsi, the blue contender, is linked to the NFL since 2002. Based on our 2018 World Cup report, Coca-Cola’s last sponsorship deal that we have details of, is from 2005, for $48 million per year for 8 years. With inflation, we’re now looking at around $60 million per year, concentrated on their soccer activity in one summer month. Coca-Cola knows how to get their money’s worth: the brand generated 766,000 cumulated brand mentions and 11.1 million engagements directly linked to the brand and the event, for a total engagement ROI of 0.18 EN/$. PepsiCo’s NFL 10-year exclusive brand partnership costs them an estimated $90M per year in fees, including all their brands. We assume that approximately 25% flows to the flagship brand Pepsi ($22.5 million) and we allocate 50% of this sum to the Super Bowl buzz. We end up with a yearly $11.25M cost-share for the Pepsi brand, only assigned to the Super Bowl. We then add the 30 second Pepsi ad broadcasting cost of 5.25M (2019 figures). Finally, the budget to exclusively sponsor the Halftime Show is estimated at around $5M. This would result in an estimated net Super Bowl investment, without production and celebrity endorsement costs, of $21.7 million for the blue soda brand. The Super Bowl 2019 generated cumulated 261,100 mentions and 1.6 million engagements for Pepsi directly linked to the brand and the event, in the 30 days the US media covered the game, for a total engagement ROI of 0.07 EN/$. Compared to Coke’s investment in the World Cup, Pepsi seems to pay a huge premium to sponsor the Super Bowl in terms of social media return on investment. This is a heavy price to pay to rival with Coca-Cola in the US social media market. Coke vs Pepsi: who won the hashtag war? Pepsi’s $5 million halftime investment had a positive return as the #PepsiHalftime hashtag grossed 162,000 mentions, #Pepsi 14,200 mentions, and #PepsiMoreThanOK 51,100 mentions during this year’s Super Bowl. The result: 227,300 branded mentions. 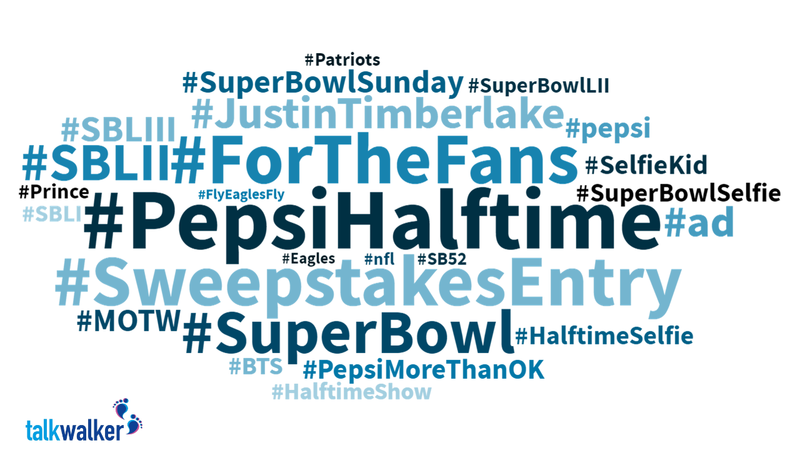 #PepsiHalftime won the branded hashtag battle during this year’s Super Bowl. Coca Cola’s global investment showed less direct measurable impact in terms of branded hashtag efficiency, as most fans focused on tagging BTS during the game. #cocacola got 43,400 mentions and #BTSxCocaCola 14,800 mentions. Their content hashtag #trophytour had only minor impact, showing that it was too difficult to decipher for the masses. stronger than Coca-Cola branded hashtags. Super Bowl: how did Pepsi perform in 2019 compared to the previous year? The viral impact of the 2018 Super Bowl event was nearly twice as strong as this year’s event. In 2018, Justin Timberlake’s performance peaked with 414,000 mentions worldwide, while Cardi B’s ad delivered 211,000 mentions. These results show that Pepsi got less return on investment on social media this year compared to last year. We see that with an estimated similar budget, the social media outcome can be very different, as other factors, political, cultural or competitive, can have a massive impact on a brand’s voice on the internet. The golden formula “sports event + famous musician” may work more or less, and brands need to remain current in order to stay relevant within their respective audiences. How do Coke and Pepsi bridge the generational gap? We can define both soda brands’ strategy as comparable and defensive, with a clear focus on the US for Pepsi, and an international approach for Coke. They both buy category exclusivity in the World Cup and the Super Bowl events, not only to convey a brand message to masses but apparently more for prestige reasons, to avoid that the despicable enemy takes over the castle. Soccer events are brand investments that target customers aged 30+, who have already decided what beverage they prefer. So, one can say that the sports event sponsorships are only a pretext, a costly stage where the battle takes place. The real deathmatch takes place within the 4 to 24-year-old Generation Z, the social media savvy, whose taste is not yet that acquired. K-Pop brand endorsement is the real wizard, the emotional content that enchants the crowd for the soda giants in these days. Coke’s BTS partnership, leveraged throughout the World Cup, is the quintessential key to its global marketing plan, and Pepsi cannot gain the same brand drive with less-known boy bands or younger stars playing at an event that still predominantly fascinates the US. Pepsi’s endorsement by rapper Cardi B led to a great viral buzz during 2019’s Super Bowl, but less efficient than a year before. Globally speaking, copying what the leader does seems to be pretty expensive and not that efficient on a world level. The key to success for global brands to bridge the generational gap lies in a sound 360-degree execution of the marketing plan and a clever combination of both the frame (sports), to catch the older, and the content (music), to catch the younger. If you are a global brand, you may decide to play a tactical national game to defend a strategic market share in a specific country. A global worldwide approach does not always make sense for specific markets. The bigger you are, the more defensive you get. Permanently tracking and understanding what your close competitors are doing and how your customers are reacting is a marketing must. Hashtag strategies need to be straight to the point, and hashtags without brand names can be a risky game for a brand. Celebrity endorsement associated with sports events may pay off for lifestyle brands, but the viral outcome can strongly differ from event to event as other factors may interfere with the brand message. This needs to be tracked properly in order to take corrective measures.